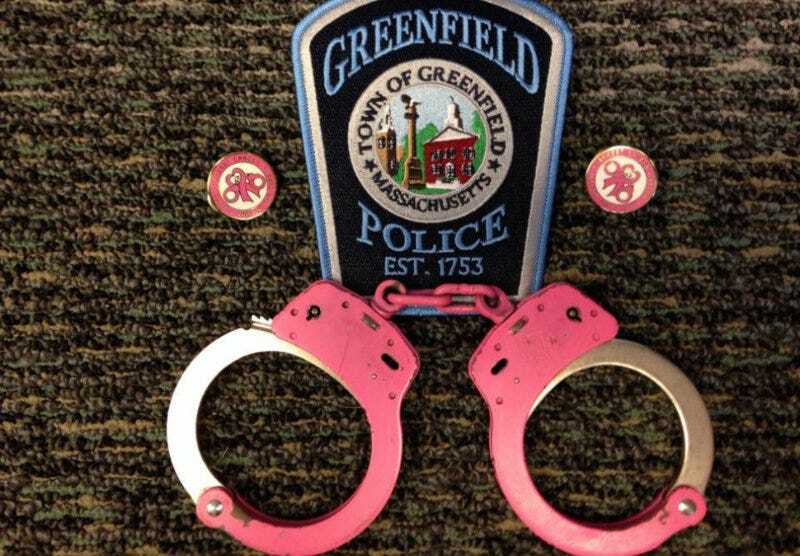 The pinkwashing Olympics have their new champion: the police department of Greenfield, Massachusetts announced on Facebook that for the month of October, they’ll be using pink handcuffs. Officers will also sport pins reading “Arrest Breast Cancer.” Because there’s no problem you can’t solve that way. October is National Breast Cancer Awareness month. While most people are aware of breast cancer, many forget to take the steps to have a plan to detect the disease in its early stages and encourage others to do the same. Many of our community members, including some of our own friends and family members, have been affected by breast or other types of cancer. Officers of the Greenfield Police Department have “gone pink” in order to raise awareness for the disease! All of our officers have changed their collar pins, which were blue and white state seals to pink and white pins which states “ARREST BREAST CANCER - UNLOCK THE CURE” surrounding a pink ribbon and a pair of handcuffs. Some of our officers have even replaced their on duty silver handcuffs with pink ones and will be using them during the course of their work day. Help us ARREST BREAST CANCER by spreading the word and by making your own early detection plan. Remember: when placing a suspect in a light chokehold or frisking them against a vehicle, always ask if they’ve performed a monthly breast self-exam. There’s no awareness like the kind that takes hold in the back of a squad car.